Paneer pakoras or pakodas or Indian cottage cheese fritters is a quick snack item. Serve it as a starter/finger food/ appetizer. If you like paneer, you are going to love this. Paneer is Indian cottage cheese. It is available in flat, square slabs in the market. 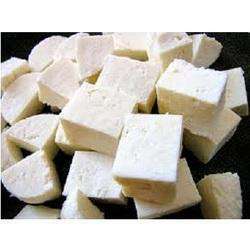 Paneer is used very commonly in making snacks, curries, sweets etc. Making for guests or for family members, paneer pakoda or paneer pakora, is a welcome snack on a wet rainy day or a cold winter day. Paneer pakoda is also a good accompaniment for lunch or dinner. It is best served hot but is still good even if served at room temperature. Paneer pakoda can also be packed for lunch along with chapati/phulka or rice. You may use homemade paneer or store bought paneer. If using homemade paneer, make sure paneer is hard enough to cut into triangles, squares or fingers the way store bought paneer is. It it is too soft, it will crumble while cutting in shapes. We do not want that to happen. Add besan / gram flour to a bowl. Add rice flour, salt, chili power, chopped chili pieces, ginger garlic paste to besan and mix well. Heat 1 tbsp oil and add the hot oil to the dry mixed flour. Mix well. Add enough water to make a thick batter. Batter should have a dosa/pancake batter consistency. Heat oil. Keep the flame medium. When oil is hot, dip each paneer in the prepared batter and drop carefully in the hot oil. You can add 4-5 or more pakoda at a time depending on the size of your kadhai (fryer) and the amount of oil you are using. Fry till the pakodas are golden brown all over. Turn the pakoras once in a while so that they will be fried evenly. Remove from oil after draining well. Fry all the pakoda in the same way. Serve hot by itself or with your favorite chutney or chili sauce or tomato ketchup. The cut paneer slices should not be very thin. You may sprinkle some chaat masala on pakodas before serving if you wish. add 1/4 tsp garam masala to batter for variation. Adding just salt and red chili powder makes the basic pakoda batter tasty too. Other spices are optional. Instead of hot oil, you may add a pinch of soda bi carb to the batter just before frying pakodas.